.Thank you for visiting. 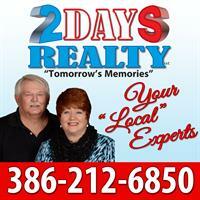 As Broker- Owner of 2 DAYS REALTY, I am proud to say I am a Native Floridian. Five generations back. This is why I can say I am your LOCAL EXPERT. I am also proud to share with you that I am an Army Veteran.Who served in the Vietnam war as a Helicopter Pilot. After coming home from the war, I became a Deep Sea Fishing Captain. I ran all size boats out of Ponce Inlet Fl, and New Smyrna Beach Fl. And luckily met my beautiful wife Julie on a fishing trip. After retiring from the Sea, I began helping in her Real Estate business. We both realized we wanted to start our own Brokerage to help not only customers, but agents as well. To handle the correct way, from start to finish. In all aspects of Real Estate. We and our Brokerage are active in our community, as it should be. My name is Julie Day, proud wife of my Husband Daniel. I am a blessed woman to have him by my side. I grew up in Pennsylvania, ran two exciting businesses. An advertising agency, and a gift shop, which I franchised six others from. I was awarded number one entrepreneur for northwestern Pennsylvania, three years running. Leaving the freezing cold for the Sunshine State in 1992. I continued my advertising company until 1995. 1995 was an exciting year. I started my Real Estate career, and married my fishing Captain. I am blessed--he catches, cleans and cooks the fish. To me there is nothing more rewarding than helping families find their Dream home, Second home, or Investment property. I have been Top Producer due to my experience, persistence and red-headed aggressiveness.